It’s been three months since the deadliest shooting in modern U.S. history took place near the Mandalay Bay hotel in Las Vegas, Nevada and we still know little about gunman Stephen Paddock’s motives. According to local Las Vegas news outlet Metro 5, key details surrounding the motive cannot be released because “additional suspects,” are still under investigation. Sheriff Lombardo previously claimed only one person is under investigation. Metro lawyer Nick Crosby believes information about the additional suspects could be revealed in 60 days. Inside a district courtroom on Jan. 16, a lawyer for multiple media outlets argued why information pertaining to 1 October is crucial to helping Las Vegas heal, but the lawyer for Metro Police said they can’t release any information because there are still suspects being investigated. On Friday a federal judge made public hundreds of pages of court documents that had been filed by the FBI in the days and weeks after the Las Vegas concert shooting. The judge did so in response to a lawsuit filed by CNN and several media organizations. This isn’t the first time Lombardo has been contradicted. According to Clark County Sheriff Joe Lombardo, gunman Stephen Paddock fired in excess of 1,100 rounds the night of the shooting. John Cardillo, a former NYPD officer, didn’t buy the claim. “1100 rounds in 9 minutes, even with a bump-fire stock, from one shooter seems implausible. That’s 2 rounds/second not accounting for reloading, or any kind of malfunction. Tough to believe,” tweeted Cardillo. 1100 rounds in 9 minutes, even with a bump-fire stock, from one shooter seems implausible. That’s 2 rounds/second not accounting for reloading, or any kind of malfunction. 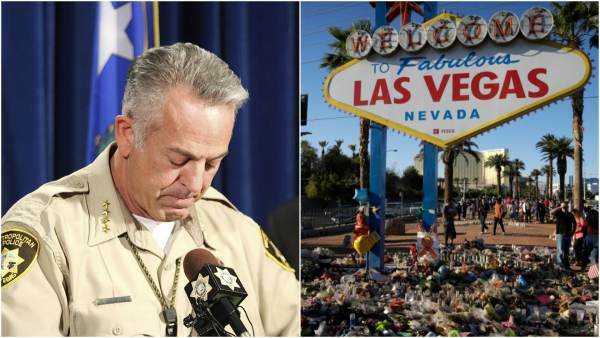 Amid the anger and confusion brought upon by an ever-changing timeline by the Las Vegas Police Department and FBI, MGM Resorts International hired an elite crisis management firm. The move came on the same day Sheriff Joe Lombardo claimed there was little difference between police and Casino timelines.